If you thought Storm Diana was bad yesterday – it’s elevated to orange | SHEmazing! Storm Diana broke many the umbrella yesterday, but today the weather extremity is taking things up a notch. The storm has been upgraded from a yellow to an orange weather warning. Ireland is in for some extreme wind and rain today, particularly in the west. 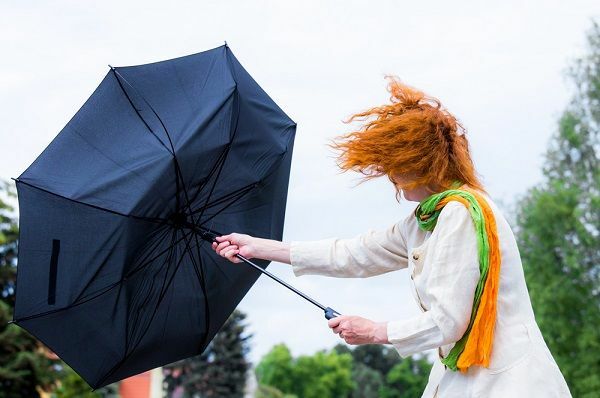 Potentially damaging gusts of up to 130km/h are forecast for counties Galway, Clare, Kerry, Cork, Waterford and Wexford. Met Éireann says there is also a risk of coastal flooding. A number of flights in and out of Dublin Airport have been cancelled this morning. Very windy on Wednesday with severe & potentially damaging gusts associated with Storm Diana. The S-SE winds will be strongest across the S half of the country during the morning but the strong winds will extend nationwide during the course of the day & veer SW in direction. Up to 4,500 homes and businesses country-wide have also been left without power today. Tragically, it seems like the storm is not moving off any time soon. It is expected that Ireland will endure stormy weather for at least the next 48 hours.